Environmental health expert Dr. Richard Jackson will discuss how the “built environment,” including architecture and urban planning, affects physical, mental and social health at the University of Notre Dame Nov. 9 (Monday). The lecture, at 5:30 p.m. in DeBartolo Hall, room 141, is free and open to the public. A pediatrician, Jackson is professor and chair of the Department of Environmental Health Sciences in the Fielding School of Public Health, University of California, Los Angeles. 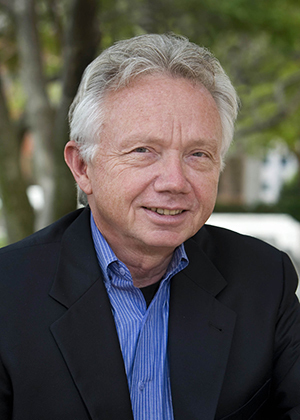 He has co-authored three books on the built environment and health, and hosted the PBS series “Designing Healthy Communities.” In March, Jackson received the Henry Hope Reed Award from the University of Notre Dame School of Architecture for his emphasis on the importance of traditional and sustainable urban design. Formerly, Jackson served as the director of the National Center for Environmental Health at the Centers for Disease Control and Prevention in Atlanta, and was chief public health officer in the state of California. He chaired the American Academy of Pediatrics Committee on Environmental Health, serves on the board of the American Institute of Architects, is an honorary member of the American Society of Landscape Architects and was recently inducted into the U.S. National Academy of Sciences Institute of Medicine, one of the highest honors a medical doctor can receive. While in South Bend, Jackson will also meet privately with the Saint Joseph County Health Improvement Alliance, community partners working with health and the built environment, and city officials to inform local efforts surrounding health and the built environment. This lecture is sponsored by the School of Architecture, the Center for Social Concerns, the Office of Public Affairs, the Center for Health Sciences Advising and the Eck Institute for Global Health. Originally published by Jessica Brookshire at news.nd.edu on November 02, 2015.